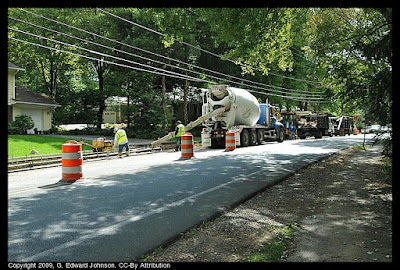 They have been working on putting in new sidewalks on Fernwood Rd near Democracy Blvd in Bethesda, Maryland for about a week and a half now. The construction won't be done until the end of October so there is still a ways to go. The good news is, if it hasn't impacted you yet, it probably wont. They have been doing a pretty good job of starting after rush hour and clearing up before the afternoon rush, although today they started a bit early. When they are actively working they have had one lane closed and used flagmen to alternate traffic down the remaining lane. Since traffic isn't usually heavy during the day, that doesn't seem to be causing many delays. They have heavy equipment on the road both to dig up the existing asphalt sidewalk and to lay new concrete so I expect the lane closures to continue. I first wrote about this project on the 21st.